Would you like to get your broken sliding glass door replaced before the holidays? At SR Windows & Glass, we have a selection of sliding door glass in various standard sizes. Reach out to us right away so that we can give you an appointment for a same-day replacement. There is a written warranty for all glass units as well as installation. The single pane and dual pane (also known as low-e glass) sliding glass doors are available in standard thicknesses and sizes. This makes it possible for us to keep them in stock within our shop and on our installation vehicles. We are able to provide our customers with same-day delivery so you do not have to wait and worry about comfort and safety for your home. The glazier who visits your office or house will make a determination on your glass patio door. 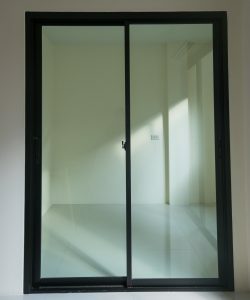 This is to ensure that it is a standard size and that he or she has the glass right there to install it immediately. If it turns out that the door is a different thickness or color or the size is not a standard one, we can have custom glass designed in the factory to be ready within 3 to 5 days. You can tell that your glass door needs to be replaced when you see a discoloration on the glass, it has a chip or crack that compromises the seal, there is moisture on the pane’s interior, or there is a foggy build-up on its interior. There are certain building codes that are necessary to meet, as well as safety standards. When it comes to glass arcadia doors, you do not want to take your chances. However, the tempered glass has relatively little risk of causing harm to people or pets when it breaks. In addition to offering high quality replacement sliding door glass, we also have other replacement parts and conduct various types of repairs. You will be pleased with our services to fix any sticky latches and sliding glass door roller issues. Give us a call at SR Windows & Glass or fill out a message form to receive a free estimate. Take the first step to getting your sliding glass door repair in Phoenix today.